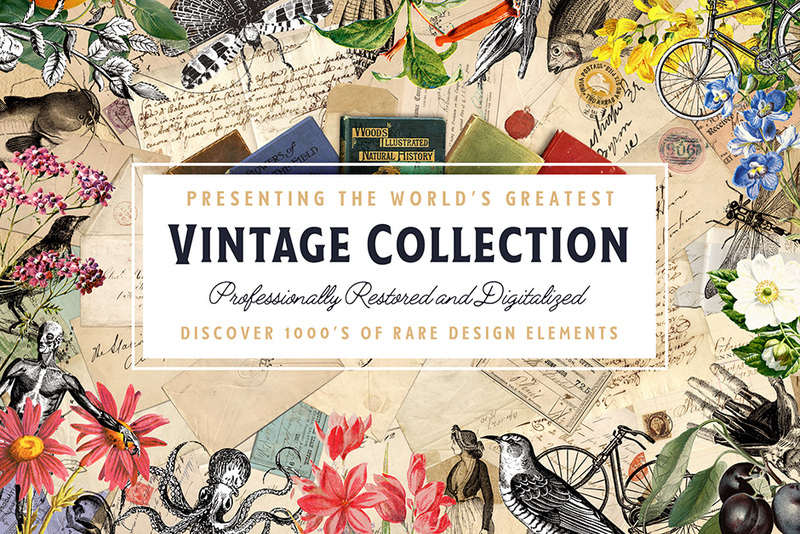 Introducing The World’s Greatest Vintage Collection: $2500 worth of rare vintage materials, carefully digitalized and made available for your projects. This is your chance to access 1000’s of rare design elements and give new life to the lost and forgotten artwork of our past. The possibilities are, quite literally, endless! All of the Illustrations that you see within this glorious pack have been collected from our personal collection of vintage books (Over $2500 worth of books and materials went into making this pack!). 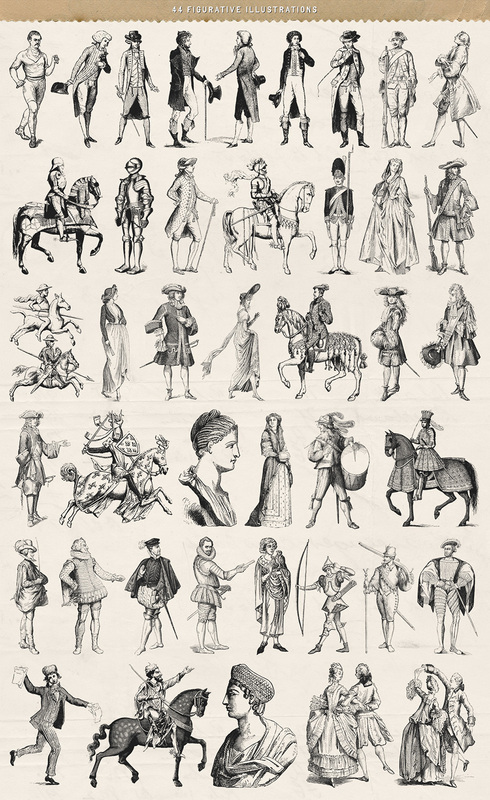 Many of the vintage illustration packs that you find today are sourced from online libraries, and subsequently the quality of these graphics suffers. However, with over 28 hours scanning, 100s of hours editing, and countless amounts of caffeine, every single illustration within this pack has been restored and digitalized to the highest possible quality. Each piece is available in 2 different formats; Vector (.AI AND .EPS) and .PNG (An Entirely Transparent 300ppi image), meaning that this pack is completely flexible and will work with all graphic applications. While hunting for our vintage books, we often come across Paper Ephemera (old stationery, letters, receipts, etc.) and some of them are just too good to miss out on. Included in this pack, you will discover 33 individual pieces that are perfect for creating backgrounds, collages, combining with the other collections within this pack, and so much more. Just like the illustrations, these pieces were individually scanned at a whopping 1200ppi for the highest possible quality, and edited with entirely transparent backgrounds; perfect for overlapping! (‘Shadow’ and ‘No Shadow’ options included!). Ranging from 4000px to 10,000px on the longest length, the level of detail is stunning. 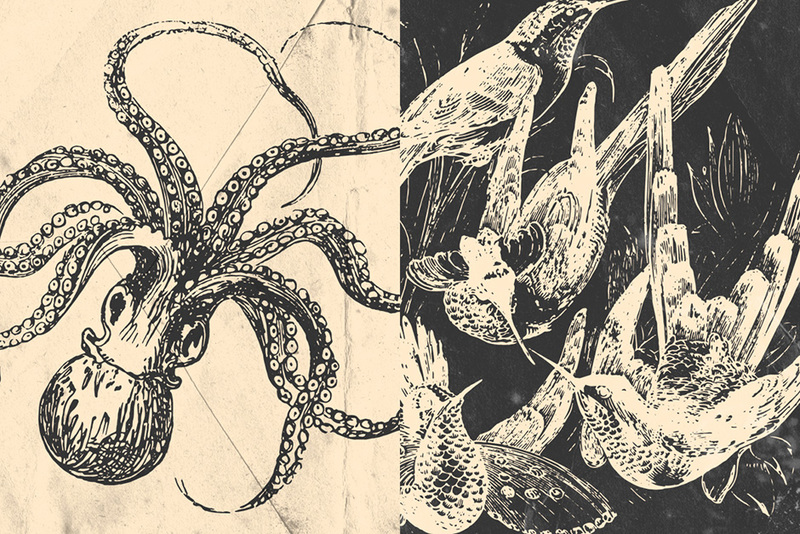 Like a fine wine, these 32 Paper Textures have got better with age. Available in three styles; Original, Black and White, and my favourite, Transparent. 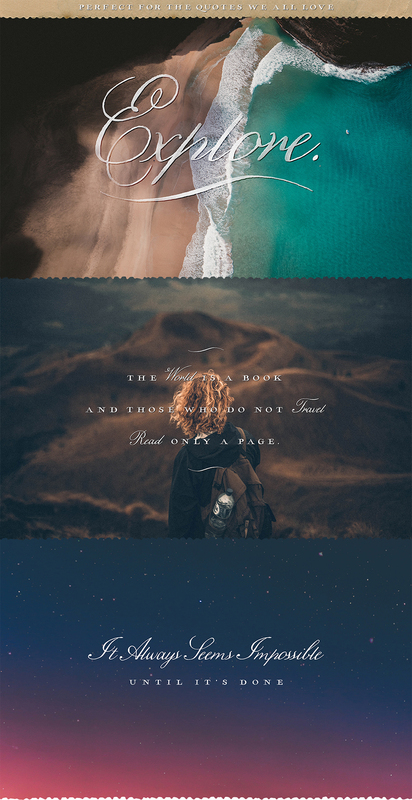 This collection is perfect for backgrounds, with the addition of the transparent option; combining with photography, typography, illustrations, and even other textures are effective ways to put these to work. The patterns within this collection were discovered inside of a 106-year-old book that we purchased from a tiny book shop that was hidden away in the corner of a coffee shop. The patterns are entirely handcrafted and many hours went into recreating them into seamless, usable pieces. The result: 12 unique patterns (inverted options also included) that are super easy to use and edit. Inside you’ll find 24 ‘Seamless Sections’ – These are high-resolution sections of the patterns that you can copy and paste over and over again to create a pattern of any size. Also, you will find 24 Pre-made A4 sheets (Transparent – Super easy to change colors!) – perfect for a quick and easy application. The gift includes 12 beautifully crafted botanical sketches that have been edited with entirely transparent backgrounds, meaning that you can drag and drop these delicate drawings directly onto your digital canvas. While this might be a bonus, we haven’t shied away from quality. These illustrations average a whopping 10,000px on the longest side, at 300ppi! And there you have it, a complete and timeless collection of vintage design goodies itching to be dragged, dropped, cropped and colored. 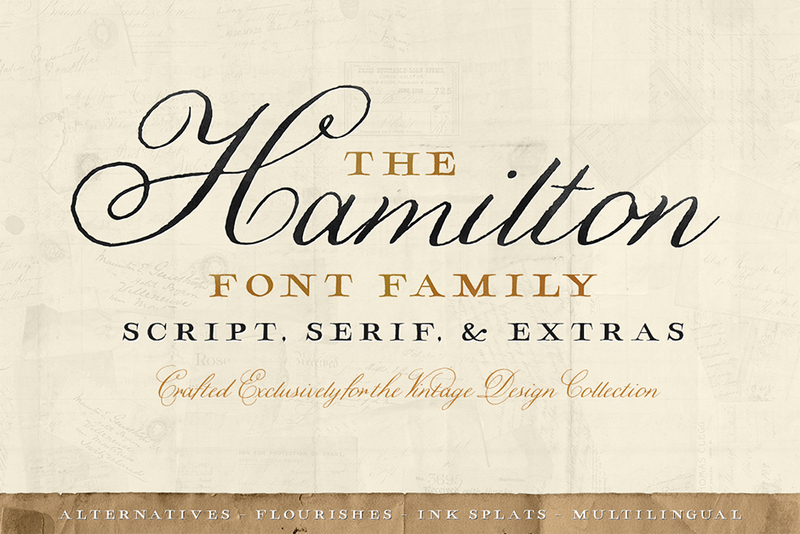 Add an extra layer of 19th-century style to your design work with the new Hamilton Font family. 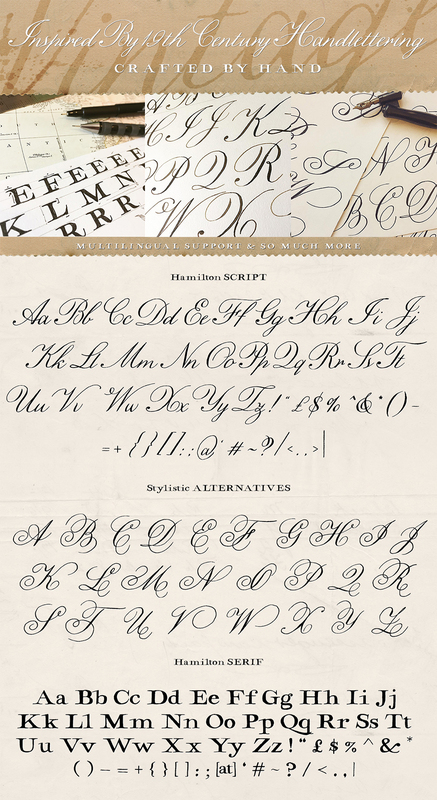 Within this family you will find; A beautifully handcrafted script font loaded with a decorative set of stylistic alternatives and perfect imperfections, a vintage map inspired serif that looks great both on its own and when paired with its cursive partner, a set of detailed ink splats (available as a font and as vectors) to add even more creativity when using any of the Hamilton fonts, and last but not least a flourish font (also available as vectors) to help bring your work to life! Each and every element of this family was entirely crafted by hand, scanned, and converted for digital use with minimal digital touch-ups to be as authentic as possible! Language Support: Afrikaans, Basque, Breton, Catalan, Danish, Dutch, English, Finnish, French, Gaelic, German, Icelandic, Indonesian, Irish, Italian, Norwegian, Portuguese, Saami, Spanish, Swahili, Swedish. Software compatibility: The vectors require Adobe Illustrator CS and newer for full editing capabilities. However, .EPS files will work with a variety of programs such as Adobe Photoshop or Illustrator, Sketch, InkScape, Affinity, Corel Draw, etc. This pack also includes a complete range of .PNG files which will work with most graphic software. Whatever software you’re using, this pack should offer full compatibility. Software compatibility: Adobe Illustrator CS and newer. .EPS files will work with a variety of programs such as Adobe Photoshop or Illustrator, Sketch, InkScape, Affinity, Corel Draw, etc. .JPG and .PNG files will work with most graphic software. File size is approx 21.92GB unzipped, offered as in 10 parts, as well as in one complete download. Hi there, I have just purchased this awesome package! 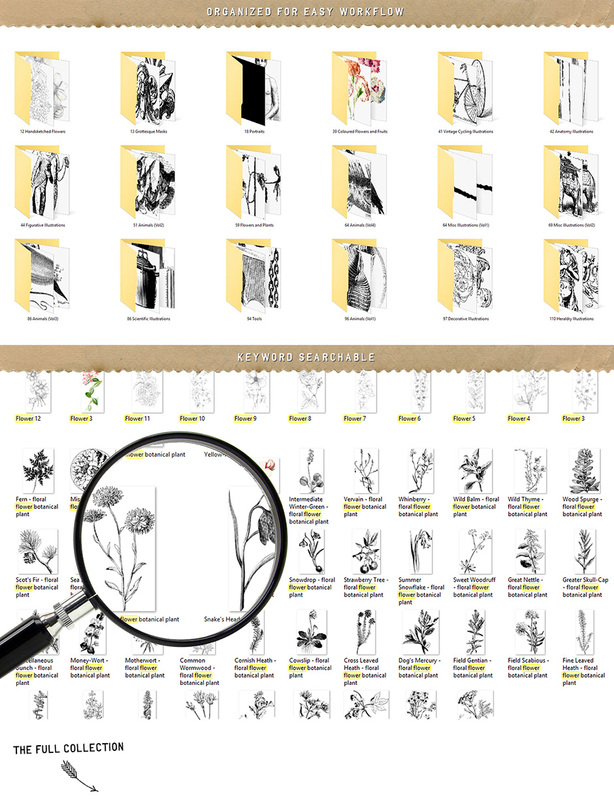 I’m specifically wanting to download the 59 monocolour flower illustrations + the 39 coloured flower illustrations. Can you tell me which specific folder I need to download for just these items please? Woohoo thanks for commenting Jackie and it’s great to hear that you love your new World’s Greatest Vintage Collection! I have just double checked the download files for you and you should be able to find the 59 mono-colour flower illustrations in your Worlds Greatest Vintage Collection-Vintage-Illustrations-Part3 download + the 39 coloured flower and fruit illustrations in your Worlds Greatest Vintage Collection-Vintage-Illustrations-Part2 :). I hope this helps you locate your files a lot easier Jackie and happy designing! Thank you so much for commenting Anne and we’re so sorry that you are unable to pick this one up right now! The majority of our marketplace items should stay available to purchase in future as they do not expire like our bundles do, so we hope that you can pick this one up in future! The collection is indeed brilliant. Thanks for Sharing Such Resources. Also, Can you please let me know that How I can I use your referral Program on my Site. Thank You 🙂 Waiting for your Reply. Have their been any updates since June of last year? Rest assured we always list any updates that we make to our products so I’m so sorry for any confusion caused. The latest update that has been made to this pack was back in June 2017! Splendid bundle brimming with vintage goodies! Thanks Vector Hut and Design Cuts team! Woohoo thank you so much Mar, we really appreciate you taking the time to leave us such an awesome comment! I just wanted to say that I purchased this set a while back but had not had the occasion to work with it until just recently, and the graphics are even more amazing up close than they are in the previews. The organization of the files and supplemental PDF are also tremendously helpful! So often, because designers are more focused on creating, they forget to organize their designs in a useful (or sometimes any!) manner, and the first thing I find myself doing is organizing the contents of folders after downloading. I truly appreciated that this set was done in such a thoughtful way that when I went to use the graphics, I found just what I was looking for very quickly. Absolutely wonderful product! That’s so great to hear that you have been taking this one for a spin and it makes us so happy that you love the graphics even more now you’ve seen them up close- we hope you’ve been having fun with them! It’s fantastic news that the organisation of the files has been helpful to you too and hopefully this will give you more time to play around with these. Thank you for taking the time to leave us such a lovely comment Jen, we really appreciate all the support. Thanks for the grreat vintage colection, i have downloaded it. Its awesome. And thanks too the dad!!!! Aww that’s great news Luc and you are so welcome! the video music is nice, what is this music name? This is a beautiful collection. I am particularly looking for buildings eg churches, hospitals, schools, gaols, places of residence. Does the collection contain any of these? Thanks for the comment on this one and we are so pleased to hear you like this one! I will also ask our product team to keep an eye out for more vintage items like this for you as well! Thanks so much for your comment and I can definitely help out! So first of all, The World’s Greatest Vintage Collection is actually an exclusive product that was created only for Design Cuts by Vector Hut so it is made up of resources provided by Vector Hut only and as its a Marketplace item, it wont expire. The bundle on the other hand is made up of resources provided by multiple designers and will expire on Tuesday 18 July and no longer be available for purchase at this bundled price. Both items contain completely different vintage resources in them and it really is personal preference for your projects. There are no double ups on resources as all our bundles are comprised of completely new resources, that have never been part of any other Design Cuts bundles in the past. I hope that helps, and please don’t hesitate to get in touch, should you have any questions. Quick question for the creator: Can you tell me where you got the background image that looks like a painted beach image that’s in the Hamilton font section behind the word “Explore”? It’s the second to last image on this page, and the heading of it says “perfect for the quotes we all love”. Thanks!! And great bundle, grabbed it for myself already. Good morning DC. This is one, truly amazing collection! I just now received the email about your (really, really) amazing $29 price tag for the day, but . . . oh my goodness! 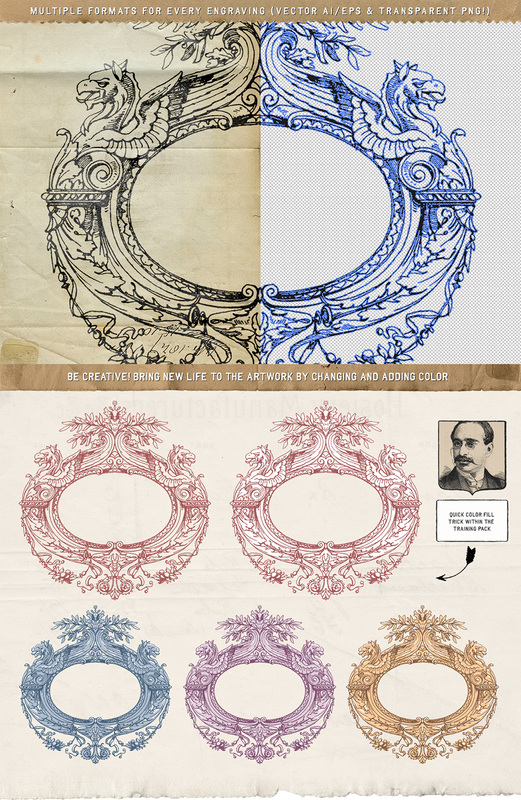 This design resource cornucopia is well worth much more than the now $39 price. Loving all original art, the fact that your dad’s creations (sketches) have been included, well . . . Wow! It just makes the collection. Keep up the amazing work! I know I sure appreciate it — 🙂 Many thanks! Oh thank you so much for leaving such incredible feedback! I guess I misunderstood that the midnight deadline on Wednesday the 28th would not be in the USA. I am on the East coast of the US and it is not midnight here yet. Sure want to add this great bundle to my other purchased collections, but I was hoping that I could purchase it tonight for the $29. I guess I will have to wait until it comes around again! Thanks for reaching out about this and sorry to disappoint you about the timing- as we are based in the UK, all of our deadlines are on UK time! Hi there, Wonderful-looking package. Could you please tell me if there is an anatomical heart in this collection? Thanks. There unfortunately aren’t any anatomical heart’s though I am afraid- i’m so sorry for any disappointment caused! Any advice on how to downloaded these files. I’ve only been able to download the hamilton font, I’ve gotten network failures on all other downloads after multiple attempts. Any advice would be welcome. Thanks so much for your comment and I am so sorry that you are experiencing a network error when trying to download this one! Thank you so much for the bundle update! The font is just beautiful and it’s so generous of Tom to include it. Thank you for the catalogue also, that will be really helpful. I had several uses in mind for these gorgeous images, but most immediately I want to use some of the animal prints as a template for some design elements in an embroidery project I’m starting. The vintage feel is just exactly what I was looking for and I was delighted to find the images I needed in this bundle. Thank you so much for leaving such a wonderful comment! I love the Hamilton font! Is a web font version included? There aren’t any web fonts included within this though I am afraid- my sincerest apologies for any disappointment caused! Thanks for including the update in a separate file for those who already bought this incredible product! as always Design Cuts surprising! Thanks so much for your comment and you are more than welcome! We are so pleased that you like the update and we hope you get loads of use out of it! We would love to see anything that you create so please do feel free to share your work with us :). I received the email update today for this which I originally purchased awhile back. I love this bundle! I’m a bit confused though, the only option I have is to purchase this for the price I initially paid awhile back. Is there something I’m missing here? Should there be another update link or something? Thanks for the comment on this one and would you mind letting me know what is happening when you click on the button at the bottom of the email. The button says “Click here to log in for your free update’ and this should take you to the login screen for your account. Once you are logged in, you should be able to see the updated file (which is free as you already own the bundle) in the Individual Files for this collection. This collection is simply gorgeous and suits my style perfectly! I have a question, however: would all of the images, papers, etc. be printable? I do not use any design or graphics software, I just want to print everything to be used in my journals. So beautifully done, and truly an amazing value! Will there be a separate update offer for those who purchased this wonderful package when it was first released, or do we need to repurchase it for the update? Thanks for the comment on this one and we are so pleased that you are enjoying the look of the update! So the great news is that if you have previously purchased the Collection, the update is free of charge and you should see the updated file in your account, under the Individual Files :). I would love to get the updates to this bundle, but I really don’t want to purchase the whole thing again (I bought the original in April). Is there a way to purchase the update only? Thanks so much for commenting here and the great news is that as you purchased this already, the update is free for you! We did send an email advising of this so my apologies if you haven’t received this yet! If you log into your account Lisa and locate the Collection on your Download page- you should see that there is a note underneath the description text advising of the update and then the first file within the individual downloads is the update itself. I have no use for this at the moment, but I wanna buy it just for its sheer beauty hahaha. well done. Thank you!, very anxious to get to work with all these products. I ‘m a lover of mid century design and finding products of this level of quality is a great satisfaction! Thanks so much for your purchase and such kind words! This is a wonderful collection – the images are spectacular! Thank you! I am working on a game with a vintage theme – very happy to have this collection among some others and maybe a few more. I would have one question maybe for the designers who put it together – do they have a pdf of the resources? Its very cumbersome to sort through Bridge, even just the process of tagging without it. I know you don’t do the galleries unless it the current deal, however, this is such a large collection and it would be so nice to be able to see them. I created a pdf – but it won’t print, file size too large, so I would have to download the image files on ur site and put it all together. Anyway – I am sure the designers must have a pdf of this? I still like to browse through resources visually all in one place. Forgot to rate it! 5 Star! I am so sorry that you are having trouble organizing your World’s Greatest Vintage Collection! Unfortunately, our PDF guides are only available with our two-weekly bundles, so as this is a Markeptlace product there isn’t one I am afraid. I’m so sorry for any disappointment caused! I always tell myself I’m not going to buy any more resources. I have more than enough! And then you release something great again and I give you all my money. This is a fantastic collection and so different from anything you’ve put together before. I will have so many uses for these items. Can’t wait! Thank you again (I think)! Thanks so much for the awesome comment and we are so pleased to hear you like this one! We were so excited to release this with Vector Hut and it really means the world to hear you are enjoying the look of this! We hope you love working with this and please do feel free to share anything that you create with us as we would love to see what you are working on! I am always impressed of the writers (typographers) who skilfully draw those calligraphic letters with grace. In the past it was a gift of many and pupils in elementary schools learnt to control it. I myself used a Parker nib pen to write my homework. It will be appreciated if you would shoot a video for us and demonstrate writing with fountain pen. What’s the point to add jpg file generated from vector? Instead retraces are done very fast in an automatic way, that is impossible to use engravings in a nice detailed work indeed. Sorry for that, I know it’s a cheap bundle but in the preview I trust a better quality compared to the file I’ve purchased. Anyway thank you for you work, a lot of files for my library. Thanks so much for your feedback on this one. Aww, thanks so much Matteo! These are beautiful and I can’t wait to start “playing” with them. I haven’t had time to look through them yet, but I’m specifically interested in Animals from Borneo, especially hornbills, silver leaf monkeys and macaques. Is that something you have available? I’m also interested in vintage tropical flowers, trees and plants. Thanks so much for your comment and purchase- we’re super excited for you to start working with these too! hi there – great selection of stuff. with all the included images? this would make it far easier to see the contents at a glance?? How long will this collection be available? I didn’t see an expiration date anywhere. I’m kind of low on funds till the first of next month, so I hope it will still be around then. Thanks so much for the comment on this one! The great news is that this is actually a marketplace product so it doesn’t have an expiry on it :). You can pick this up whenever you would like! As it is part of our marketplace as well, you can also use our build a bundle feature Carol to get up to 50% off the listed price! I hope this helps, and please don’t hesitate to contact me should you have any other questions. There’s usually a PDF guide for all the files. This makes navigating the folders a snap. Did I miss the pdf? Please help – there are so many awesome files to go through and my computer isn’t fast enough to preview them folder by folder. Thanks! I appreciate everything in this collection but I assumed that the vintage book covers shown in the previews were also included. My error, but I love old book covers and that is one reason I bought the package. I’ll investigate further next time. I apologise for the confusion. Including them never crossed my mind, but now that you’ve brought this to my attention, it’s really not a bad idea! Some of the books have stunning covers that would be great in combination with the included paper ephemera. Beautiful collection from a truly talented artist. I have many of Tom Chalky’s fonts, textures and illustrations, and this package is no different. Everything he creates shows the time and skill he puts into his work to create a quality product. Amazing, imaginative, highly detailed craftsmanship from a professional designer that will never let you down. Morning Claudia! What a lovely comment to wake up to, thank you. I hope you enjoy the collection as much as I did creating it! That really means a lot to the whole team :). I hope you have a wonderful time working with this one and I can’t wait to see what you create! Great bundle, thanks so much! I’m already using imagery from the collection for my new blog I’m designing, specifically for hero banners. That’s great news and thank you so much for your purchase! I just missed the deal too! 🙁 Before I purchase, can you tell me what programs will allow you to change the colors of the different elements besides PS? Thank you. Thanks for your comment. I’m so sorry to hear you missed out on the introductory price for this vintage collection! The good news is that there are a number of softwares that will allow you to change the colour of these elements 🙂 If you could let me know which one you are working in, I’d be more than happy to send you some guides on how to do this! I hope this helps, Beth, and please don’t hesitate to contact me should you have any other questions. I’m here to help! Argh! I narrowly missed it! Any, any chance of still getting it for $15??? Thank you so much for your comment and I am so sorry that you missed the intro discount! The offer ended just under 2.5 hours ago, so we aren’t able to offer any extensions on this I am afraid- my sincerest apologies for any disappointment caused. Hi. The bundle looks fantastic once more. I missed the last one. Was wondering how much of the bundle will I be able to use in Photoshop? Only have the standalone program? Hey Sue! You’ll be glad to hear that everything you see in this collection can be used within Photoshop. Happy Creating! What about Illustrator? How much of the bundle can be used in Illustrator? Incredible – it’s a dream! Marc, Wake up! It’s not a dream! It’s real and time is running out! 😀 – I hope you enjoy the collection, Marc! Thanks for grabbing a copy. I did not miss it!! Thank you for this 24 hour discount!!! Oh WOW!! The long-awaited is now here!! And full of Vectors again? I haven’t even finished my last Vector Dance and you guys at DC do another one? REALLY?? Oh my goodness. I think I am dreaming. Quick give me the Vector pinch and see if I can get out of it soon. LOL. TWO-IN-A-ROW!! Team DC is certainly testing me with this back-to-back vector deals… and this one is a superb one as well. Well Team DC, when it come to vectors and exclusive bundle like this, one sentence for you guys.. Go ahead, make my day. Throw as many vector bundles at me one after the other and see if I CAN miss even one. Haha. Double happiness for me and of course, as always, the fullest 5-Star for this amazing bundle. I must warn you guys at Team DC.. DON’T DARE TO STOP… producing superbundles. 😀 You guys are the best!! Salute!! Your support as always is very much appreciated Iskandar! Amazing works! Before purchasing can please clarify the copy right from these vintage books? I hope this helps, Ying, and please don’t hesitate to contact me should you have any other questions. I’m here to help! It looks like the license prohibits using the items on their own commercially, unless it states otherwise in the item details which I don’t see here. Does that mean that I cannot use one of the animal graphics on a tote bag (for resale) without adding text or something else? Is adding a line of text even enough? One of the examples in this pack is an image on a tee shirt all by itself… but that’s not okay for commercial use? It’s a lovely pack and I look forward to using it for my business and want to make sure I understand the licensing info before I go into production. Thank you! You are absolutely right, you couldn’t use one of the animal graphics on a tote bag on it’s own I am afraid! 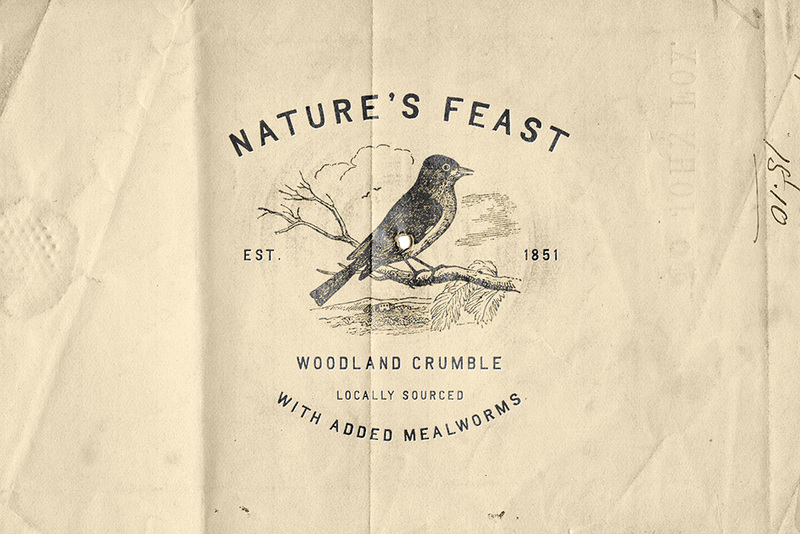 To just add text also wouldn’t be enough to warrant a wider design- the animal graphic would need to be combined with other resources, artwork or original design work, so that it does not constitute the primary integrity of the design. The preview images that you see are provided by the designer as ways that they feel, will best portray the design. Whilst we completely appreciate that our TOU may not allow for the resources to be used in this way, the designers want to show their work in different lights so we will always have this stated on the deal page to save any confusion- my sincerest apologies if you missed this! Thank you so much! It’s a great collection! Thanks so much for your kind words! 🙂 We really appreciate it and we hope you enjoy working with your new resources! If you ever have any queries, please do let me know. I’m here to help! Many thanks to Tom Chalky (and his dad) for this lovely and amazing collection! Thank you so much for your lovely comment! 🙂 We really appreciate it and we hope you’re enjoying your new vintage resources! Are there eps and png versions for everything in this collection or are some of the things for Illustrator only? Hope this helps! If you have any more questions, fire away. I hope you enjoy the collection! Thank you for your comment! Tom has jumped in here and assisted you with this query (thanks, Tom!) 🙂 I hope it helps and please do let us know if you have any other questions. We’re here to help! 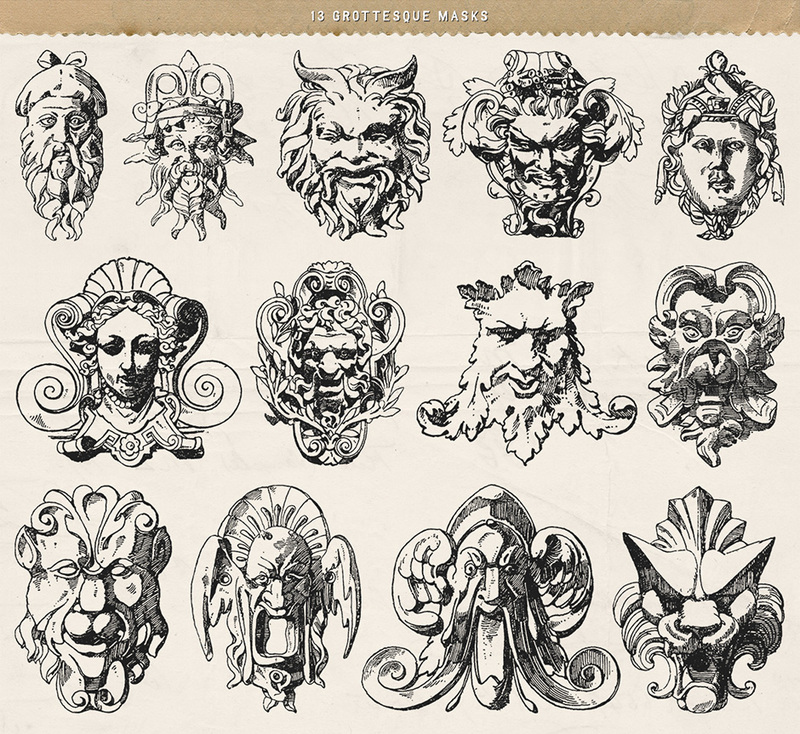 On the graphic showing all the vector illustrations together there are some on the right of the image that I cannot find anywhere later on, these include an orrery and a giant cannon. Are they in this pack? The Orrery (one of my favorites) and Cannon are indeed within the pack. When you dig into the files, you’ll find them within the Miscellaneous Illustrations folder – If you have any more questions, fire away! Thank you for your comment! I’m really sorry for any confusion but rest assured, I am on the case to track this item down for you 🙂 I’ve sent you a quick email to get some more information from you. I hope it helps! How much time we have to purchase it at the special price of 15$? Can we use it also for commercial use? It’s our absolute pleasure (I’ll be sure to pass your appreciation on to my Dad). I’d love to see what you’ve come up with! Thanks again, Mel, and if you ever need any help with anything, please do let me know. I’m here to help! I can’t thank you enough for all this wonderful and awesome work! Thanks for your lovely comment, I really hope you enjoy the collection! We hope you love working with your new resources and if you ever have any questions or queries, please do let me know. I’m here to help! You guys make me create things I would never do otherwise (strictly graphically speaking :D) Truly inspiring collection. THANK YOU SOOO MUCH! Thanks again, Gyongyi, and if there is ever anything I could assist you with please do get in touch. I’m always happy to help! 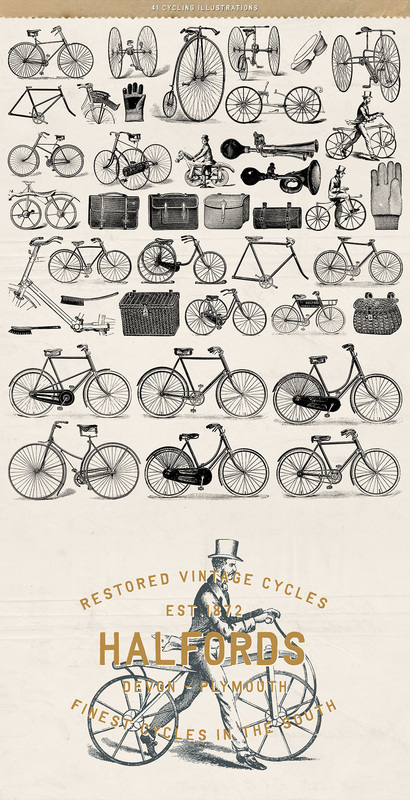 Back in December, I bought The All-Encompassing Vintage Design Bundle. Is this new bundle completely different, or is there some overlap? Thanks! Thanks for helping out Louis! You’re correct, there’s no overlap at all. This product is entirely new. Thank you so much! We hope these resources make a fantastic addition to your creative toolkit 🙂 If you ever have any queries, please do let me know. I’m here to help! Thank you for, yet another, phenomenal design cuts package! Cheers! I absolutely agree with you, Liz! Thanks again, and if there is ever anything I could assist you with please do get in touch. I’m always happy to help! Oh, WOW!, Wow ! Wow! s book and the movie “The Great Gatsby” ! I have some images but NOTHING like this! Also like Mr G P above-fantastic to see some Olde English images! I can’t wait for the morning to start work now! Thank you so much for your lovely comment! It’s fantastic to hear these items will make a fantastic addition to your F Scott Fitzgerald project 🙂 We would love to take a look and see what you’re working on! Thanks again, Angela, and if there’s ever anything I can assist you with, please do let me know. I’m here to help! I did indeed jump out of bed thinking that I will be going over all those lovely goodies!. As I go through I can select the most appropriate for this new project.. and no doubt get side tracked too! Iy will be a while but yes I will send toy some pictures of the finished project! That is fantastic to hear, Angela! 🙂 We look forward to seeing some of your work soon! Mamma mia ! What a truly wonderful product! Haha thanks Fred for the awesome comment :). We are delighted you like this one! Merveilleux. I appreciate the work. Thank you for taking the time to comment and we are so pleased you are liking this one! The collection is indeed brilliant and this American says “Thank you” for the British resources. Brilliant. Will be purchasing when I get home. And lots of British resources for once rather than US. Fantastic. Thank you so much for the awesome comment and we are so happy you like this one and are happy with what’s included :). I have read the commercial license https://www.designcuts.com/licensing/ on this link. But I still do not quite understand its specific legal restrictions! For example, I know I can not lease and resell these resources to a third party, but can I put it on a T-shirt and sell T-shirts? Can this be purchased even by Japanese people? We hope that you have great fun finding some new resources for your collection and please let us know if you have any questions- we are always happy to help!